If you’ve been paying attention lately then surely you’ve seen the fact that celebrity endorsements for headphones are all the rage. Beats by Dre, SMS by 50 Cent and more are flooding the booths here at CES. The problem, however, is that either these music celebrities have had nothing to do with the design of the headphones, or they’re just deaf. There’s simply no other reason for the headphones to sound as bad as they do. Beats by Dre are sloppy, over-emphasized on bass and they’re a complete ripoff for their price points. SMS by 50 keeps that sloppy factor, with drivers that you can hear flopping around inside of the compartment and highs that are so overdone that they’re painful. Enter Soul and Ludacris. I’ve had high hopes for this line of designer headphones since they were first announced. After finally getting an ears-on with every model I’m convinced that they’re everything that they’re cracked up to be, with only a couple of minor quibbles. Individually, I was exceptionally impressed with the SL99 in-ear model, as well as the SL300. At a mere 30 grams, the SL99s were able to reproduce accurate sound across a wider range of frequencies than almost any in-ear monitor that I’ve ever heard. The only ones that have trumped them, in my experience, are Shure’s prosumer models, with prices that are more than 3x that of the SL99. The SL300 model employes active noise canceling, powered by a pair of AAA-size batteries in the right ear cup. Fortunately, even if the batteries run out, the headphones will still work in passive mode. Unfortunately, and in a fact that’s difficult for me to explain, passive mode on the 300 model doesn’t sound nearly as rich and full as when the noise canceling is active. Chances are that Soul has employed some frequency boosting with the noise cancelation, and this is glaringly obvious when you flip the switch. We had the chance to sit and talk with Soul CEO Bob Bonefant, as well as Ludacris himself. 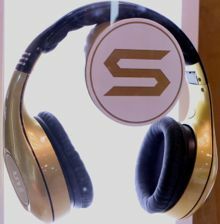 Both were emphatic about the musician’s role in the design of the headphones, Ludacris stating that “I’ve been involved at every step”. You can read more about that, and watch the full interview, over here. For now, just know that Soul and Ludacris have done some incredibly nice work with the different models and they’re the first “endorsed” headphones that I can feel comfortable recommending. In fact, I’m buying the SL99s soon, and probably the 300s shortly thereafter. More CES 2012 coverage? Click here!